New Delhi: The Jamia Millia Islamia University will organise a Sufi dance and music programme where a Mawlawiyah group from the Arab Republic of Egypt would perform, an official said Wednesday. The programme, organised by the India Arab Cultural Centre (IACC) of the university, is scheduled to be held Dec 9 at 5 p.m. on the university campus. The IACC earlier organised dance and music programmes where troupes from Egypt, Jordan, Lebanon, Morocco, Palestine, Qatar and Syria participated. President MRs. Pratibha Devisingh Patil, Vice President Mohd. Hamid Ansari, Prime Minister Dr. Manmohan Singh and other dignitaries after paying tributes to Dr. B.R. 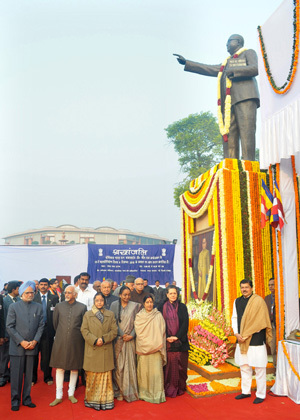 Ambedkar on his Mahaparinirvan Diwas, in New Delhi on December 06, 2010.